BMF Printed Business Guides cover a wide range of industry issues such as Health & Safety, Transport, Environmental, Employment, IT and Security are available for BMF members. A preview of our business guides are shown below. Simply log in to your account and access these in the secure downloads area. This guide was developed by senior health and safety representatives from merchant, supplier and service member companies including BMF Safety Plus providers Southalls. The guide outlines the defined standards to be adopted by BMF member organisations.The intention is that such standards and guidance will create a more formal definition of what constitutes “standard industry practice” or “industry best practice” and it is hoped this will eventually lead to the development of an HSE-agreed Approved Code of Practice (ACoP). This Material storage and handling - in branch business guide was put together by senior health and safety representatives from merchant, supplier and service member companies including BMF Safety Plus providers Southalls. The guide outlines the proposed standards to be defined and adopted for BMF member organisations. The intention is that such standards and guidance will create a more formal definition of what constitutes “standard industry practice” or “industry best practice” and will eventually lead to the development of an HSE-agreed Approved Code of Practice (ACoP). The most important legislation relating to price marking when dealing with consumers is the Consumer Protection from Unfair Trading Regulations 2008 (‘Regulations’). The Regulations prohibit merchants from engaging in unfair commercial practices with consumers and prohibit pricing practices that are false or misleading.Merchants are required to behave professionally and responsibly in the pricing of their products.In addition to the Regulations,overlapping obligations for the trader to consider are found in the Consumer Contracts (Information, Cancellation and Additional Charges) Regulations 2013 and The Price Marking Order 2004 (Order) which revokes the Price Marking Order 1999. There are certain general requirements for merchants to think about when pricing your products. Most regulations are aimed at protecting consumers. As most merchants sell to trade customers and consumers, these requirements are usually relevant. The Modern Slavery Act (the ‘Act’) was brought into force in October 2015. It is designed to take action to prevent the exploitation, servitude and trafficking of people who may be forced into working against their will. BMF’s employment lawyers Halborns outline the requirements of the Modern Slavery Act 2015 in this guide. Fire Doors are critical life safety products and must be fitted with compatible components to work safely if a fire breaks out. 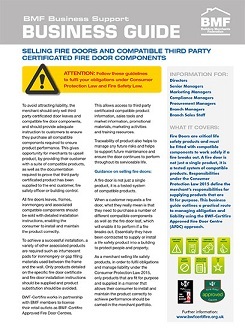 A fire door is not just a single product, it is a tested system of compatible products. Responsibilities under the Consumer Protection Law 2015 define the merchant’s responsibilities for supplying products that are fit for purpose. This business guide outlines a practical route to managing obligation and liability using the BWF-Certifire Approved Fire Door Centre (AFDC) approach. The BMF and WWF-UK’s Global Forests & Trade Network (GFTN) have come together to promote responsible trade in forest products. This guide seeks to inform members’ choice on whether to obtain timber chain of custody certification. It outlines the background to the debate, gives views from our marketplace, and details key considerations for BMF merchant members. This Workplace Transport - in branch guide outlines the proposed standards to be defined and adopted for BMF member organisations. The intention is that such standards and guidance will create a more formal definition of what constitutes standard industry practice” or “industry best practice” and will eventually lead to the development of an HSE-agreed Approved Code of Practice (ACoP). Like the weather (and because of it), the weight of pre-filled bags of aggregates can vary a lot, which can pose potential problems in relation to the Weights & Measures Act 1985. This Business Guide outlines a practical approach to ensure such problems are avoided. Follow these guidelines to ensure compliance with Trading Standards requirements. The purpose of this guide is to provide an overview of the common VAT risk areas that require careful consideration when entering into property transactions. The purpose of this guide is to give a high-level explanation as to the following rebates and refunds, as well as the general VAT treatment of them. The purpose of this guide is to detail the correct VAT liability of all types of construction services and goods that are exceptions to the standard rate of VAT. Each member should ensure that the risks at their own branches are identified, assessed and controlled appropriately. This business guide was put together by senior health and sfety representatives from merchant, supplier and service member companies including BMF Safety Plus providers Southalls. The guide outlines the proposed standards to be defined and adapted for BMF member organisations. The intention is that such standards and guidance will create a more formal definition of what constitutes "standard industry practice" or "industry best practice" and will eventually lead to the development of an HSE-agreed Approved Code of Practice (ACoP). Each member should ensure that the risks at their own branches are identified, assessed and controlled appropriatly.